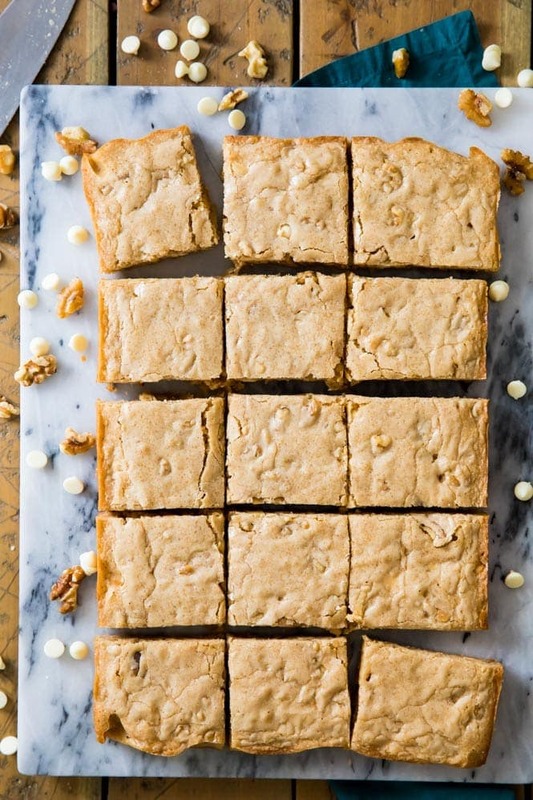 This is the best chewy blondie recipe! Buttery, soft, and simple to make (no mixer required!) I think you’re going to really love these! This recipe is very similar to my well-loved chocolate chip cookie bars and is every bit as good! 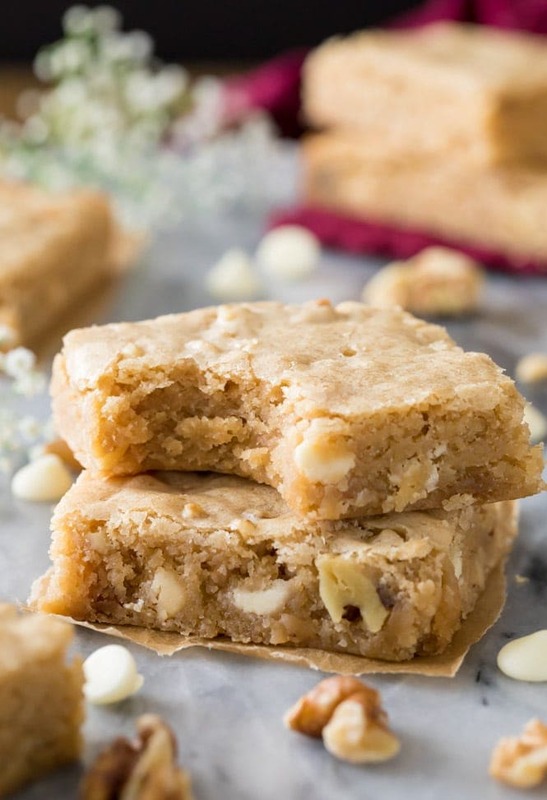 My Blondies recipe includes options for mixing in chopped nuts or white chocolate chips, but these cookie bars taste just as good without any add-ins at all. Be sure to check out my how-to video at the bottom of the recipe! Thank goodness I had this easy blondie recipe planned to share today! If you’ve been following my Instagram stories you already know that Zach and I are fostering three 7-week old puppies. They are the cutest, goofiest, fluffballs I’ve ever seen, but they’re also exhausting, so excuse me if a few of my sentences are a little incoherent today. 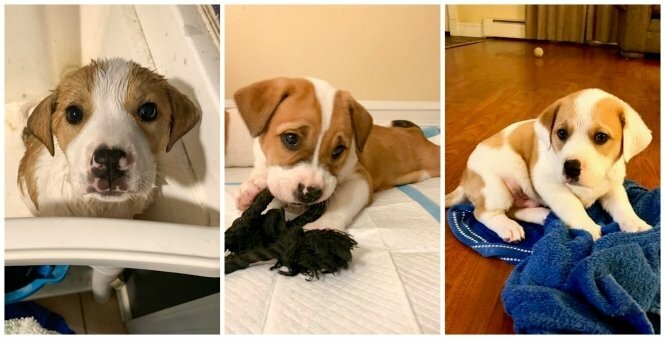 Bonus puppy pics at the bottom of the post! But back to the blondies. 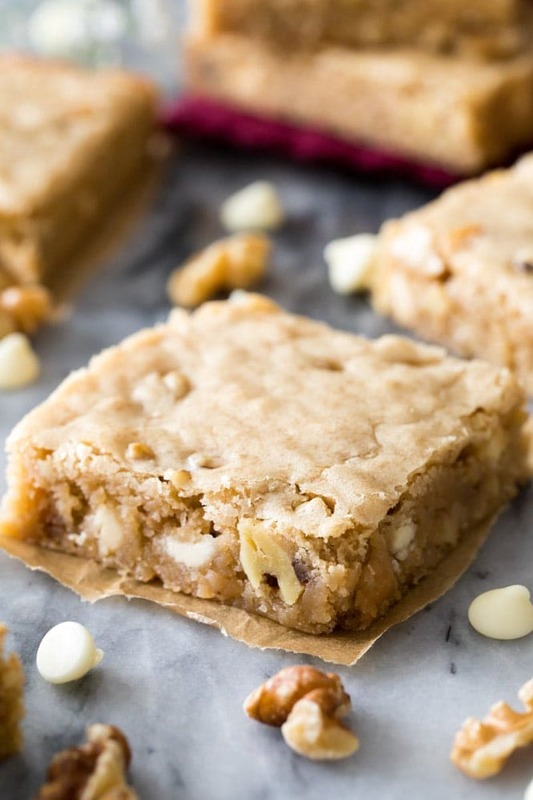 Buttery, soft, chewy, loaded with your favorite add-ins, these cookie bars are packed with flavor and they are the perfect easy snack when you need a dessert in a pinch. Fortunately today’s recipe is super simple because I don’t know that I’d have the brainpower to focus on anything even mildly complex right now, but I do have a few tips and other info I want to share with you. The main difference between a blondie and a brownie is the chocolate. Blondies are occasionally referred to as “blonde brownies”. They are made without cocoa powder and aspire to a rich vanilla flavor rather than a deep chocolate one. Blondies are also often made with brown sugar, and while I do use brown sugar in my brownies, the flavor has a more noticeable affect in the blondies (more on that below). Here’s my favorite brownie recipe if you’re in the mood for something chocolatey! You can use all light brown sugar, all dark brown sugar, or a combination of the two for this blondie recipe. I like to use half light and half dark. Keep in mind that if you use all dark brown sugar your blondies will have a richer, sweeter taste and a more moist texture. Melting the butter for this recipe gives the blondies a buttery taste and a soft, chewy texture. I much prefer melting the butter to creaming my butter and sugar when making blondies and cookies for this very reason (I do the same thing with my chocolate chip cookies). The extra egg yolk and the cornstarch are also key ingredients for making these blondies soft and chewy. I talked a lot about why I use cornstarch in my recent pumpkin bar recipe, if you want more information on that! You can add up to 2 cups of your favorite add-ins to this blondie recipe. I listed a mix of chopped walnuts and white chocolate chips in the recipe. I found that this combination provided a nice balance of sweetness and crunch. Of course, you can also leave the add-ins out completely! Alright, well I have two puppies pulling on my shoelaces right now and another that’s determined to devour my couch, so I’m off to take care of that. Enjoy! This is the best chewy blondie recipe! 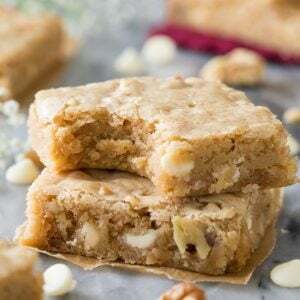 These cookie bars include the option of adding white chocolate chips and nuts, but they taste just as good without any add-ins! Combine melted butter and sugar in a large bowl and stir well. 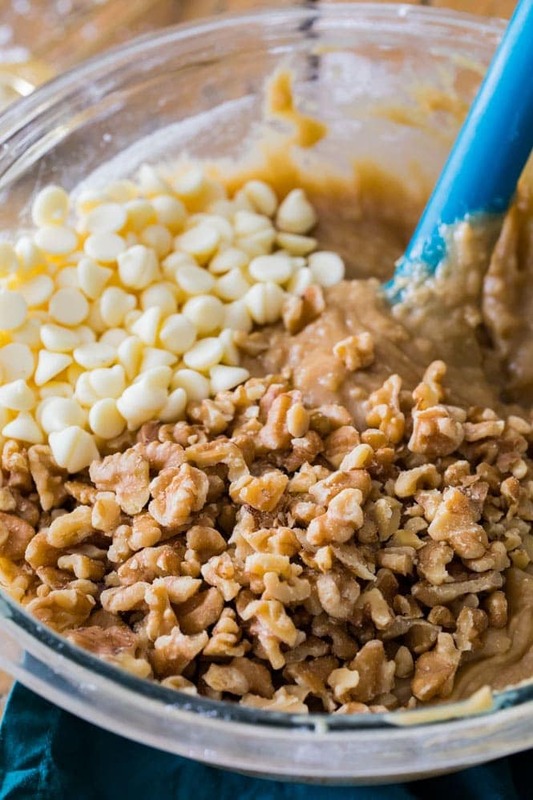 Fold in white chocolate chips and nuts, if using. Spread blondie batter into prepared pan and transfer to oven. Bake on 350F (175C) for 25-30 minutes*** or until a toothpick inserted in the center comes out clean or with a few fudgy crumbs. * I like to use half dark and half light brown sugar in this recipe. You can use all light or all dark, either will work, but if you use all dark brown sugar the blondies will be a bit richer, sweeter, and more moist. **If you don't have parchment paper you can lightly grease and flour the sides and bottom of your pan instead. ***If you use a glass pan it will likely take longer than the suggested time to bake. Piper, Paula, and Paul (we didn’t name them!) are available for adoption through the rescue that Zach and I volunteer for: For the Love of Dogs Rescue. hi. when it says 100g of sugar is that just normal granulated sugar or caster sugar. I made these for my young son and his friends on an 8-hour road trip. I used 200g of chopped dried mangoes instead of white chocolate and nuts (allergy). Turned out soft and chewy mango bars. Everyone loved it and keeps asking me when I’m going to bake it next. This recipe is perfect! Thanks so much for sharing. Absolutely delicious! It was my second attempt at making Blondies. I tried another recipe a few years ago and it was overly sweet. These are just perfect. I didn’t add any extras in but next time I will try mixing in Heath bits. 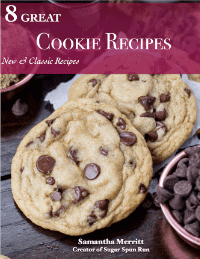 Great recipe and a big hit! We are not sweet eaters but were in the mood for something. I had all the ingredients for this which are about the same as cookies… did not want to go the trouble of making cookies. Followed the base recipe to the T. Only difference was using add in’s I had on hand… regular chocolate chips ( about a scant cup), pecans (about 1/2 C) and coconut flakes (ehhh…just shook some in). Came out awesome. My oven stinks and needs adjusting. Used a glass pan prepped without flour….and baked for 20 minutes which gave me a clean toothpick… color was not yet achieved so turned off oven heat to finish off residual for 5 minutes…we prefer under done vs over done. I saved the recipe and will now be my go to. I am thinking next time I may try adding chopped pineapple to it… may increase the flour a bit to compensate for the moisture…can’t see how it will go wrong because this is awesome and moist as is! Sam thank you for sharing this recipe, I made the blondie it was delicious. I omitted the nut because I made it for an event, and I didn’t have any cornstarch in the house but they were still delicious. Everybody loved it. Next time I will include nut and I will make sure I have some cornstarch on hand. I just made theses and subbed in grated carrots. This recipe was so easy to follow and they taste great. The only problem is that they taste a bit eggy…is that just me? So glad you enjoyed! I haven’t noticed any eggy-ness so I can’t comment on that, I’m sorry! i live at 5,000 ft. elevation and made no changes. they came out wonderfuly delicious!!! i did use regular chocolate chips instead of white. thats just what i had on hand! These are amazing! I added replaced cashews with walnuts do to an allergy. I’ve made them several times! Yum! What are ingredient amounts for high altitude? Oven temp?